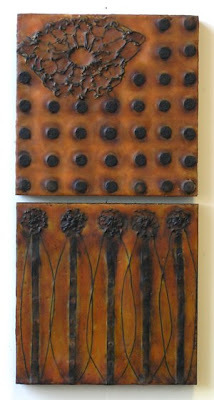 Allow me to present the latest two pieces in my rubber+encaustic series. They are "Subliminal" and "More Subliminal." The first piece has things (my secrets) embedded in poured encaustic, then painted with oil paint and oil stick. 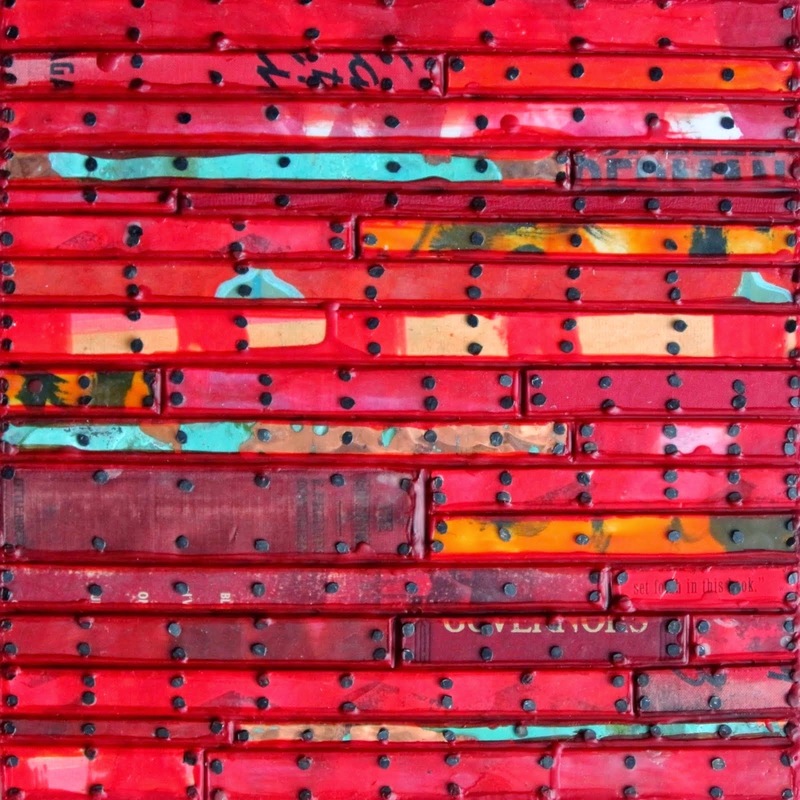 Subliminal, encaustic, rubber, tacks, patinated copper, oilstick, mixed media, 20" x 16". 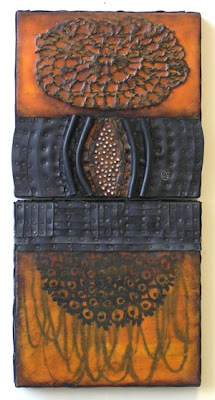 More Subliminal, encaustic, rubber, tacks, patinated copper, oilstick, mixed media, 20" x 16". The second piece has a more shallow center section because the embedded objects are smaller (beads - thanks to Binnie Birstein's donation). Both pieces are covered with rubber on the sides, the same way I have treated most of the work in this series. 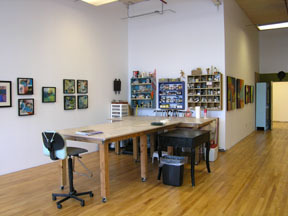 You can also see that the rubber protrudes and forms a channel for the encaustic section in the center. "existing or operating below the threshold of consciousness; being or employing stimuli insufficiently intense to produce a discrete sensation but often being or designed to be intense enough to influence the mental processes or the behavior of the individual: a subliminal stimulus; subliminal advertising." (according to dictionary.com). So you could understand this work to refer to those things that we don't really observe but just feel the effects of. I guess this would be comparable to those things in the physical landscape that we take for granted and don't look at closely, such as rocks or pebbles underfoot. I have made a conscious effort in the rubber+encaustic series to give the work a vertical orientation, meaning that they refer to the body (versus a horizontal orientation referring to the landscape). My focus is on the body these days as I am paying closer attention to the way it breaks down and changes with age. Such changes are usually subliminal until one day we wake up and realize that old age is upon us. But at least we're waking up. 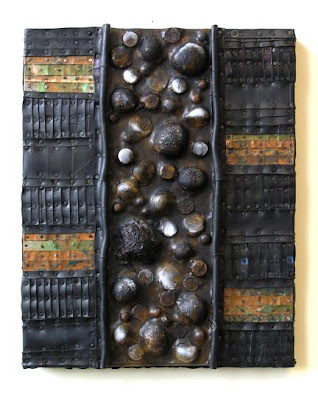 "Versatility", 2006, a work by el Anatsui, purchased by the Fowler Museum at UCLA in 2007. Recently I realized how important textiles, or at least a "textile sensibility" (thanks, Daniella Woolf), are to me in my artmaking. 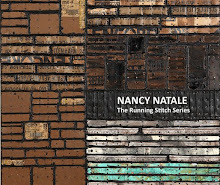 Why this news flash suddenly came to me after all these years, I can't quite explain, but I think it has to do with resurrecting my work from the '90s that used strips of a material (notice I didn't say cloth) to cover wooden panels. I am now working in this way again, mostly using rubber strips and encausticated book pages (my new term) as my materials of choice. 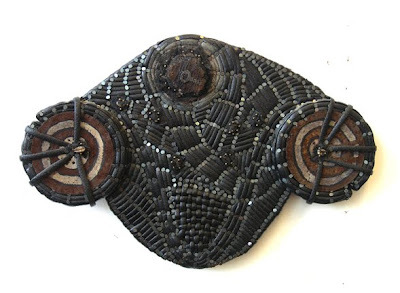 "Twins", a work I made in the mid 1990s, of mixed and found media, about 13"H x 20"W.
This realization also came from looking at the work of el Anatsui, a Ghanaian sculptor who has lived in Nigeria for nearly 30 years. 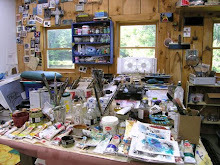 I have written about him before here and included some photos of his fabulous work. His best-known work is made with recycled bottle caps and colored aluminum wrappings from bottles of wine and other alcoholic drinks. The metal pieces are joined together with wire to form walls of great physical presence. They are sculptural but also similar to textiles. 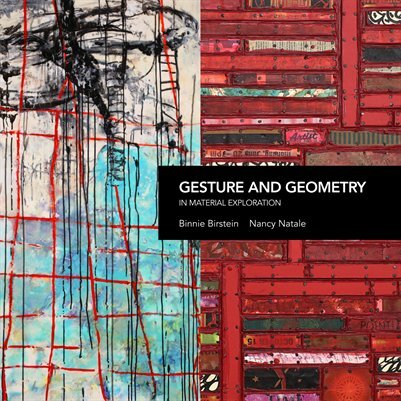 In my search for more information about him and his work, I recently came across a great web link on a blog written by Robyn Gordon, a sculptor in South Africa, who carves wooden totems and panels (thanks to Leslie Avon Miller for Robyn's link). 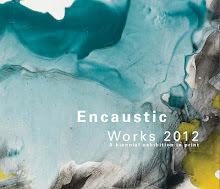 Robyn posted the link to a show called "Gawu" of el Anatsui's work. Gawu was organized by the Arts Council of Wales and the Oriel Mostyn Gallery, a contemporary art gallery in Llandudno, Wales. This show traveled to the Fowler Museum at UCLA, and the Fowler has put up the website that not only shows more of el Anatsui's work in one place than I have ever been able to find but that also has three podcasts of him speaking about particular works. 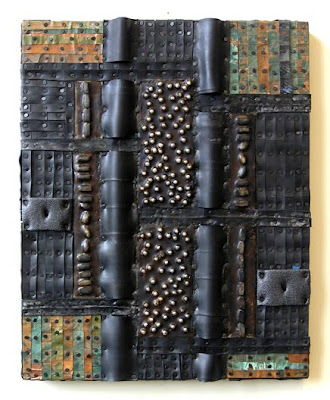 "Adinkra Sasa", 2003, by el Anatsui, aluminum, copper wire, cloth. Adinkra is a system of graphic symbols or iconic marks developed by the Asante people of West Africa. Originally the marks were used on funerary clothes and conveyed attributes of the deceased, cultural and philosophical meanings and religious beliefs. Stamps of the symbols were carved out of calabash rinds and charged with an ink made from bark and iron slag. Repeating, gridded patterns were stamped onto textiles originally woven locally and later imported. New symbols are still being created, although today, from what I could learn, most of the adinkra cloth is silk screened rather than stamped by hand. 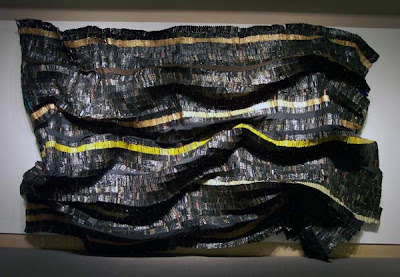 According to the Fowler Museum site, "Sasa" can be defined as "patchwork", and Anatsui means this artwork to refer to the carving up of Africa into a patchwork by Europeans. 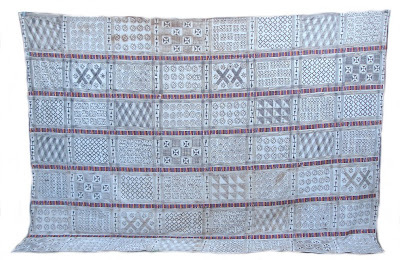 Adinkra cloth made between 1930 and 1950 offered for sale online. 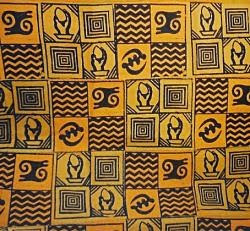 Contemporary silkscreened adinkra cloth showing a much more graphic composition and some of the new symbols. Anatsui's work, as you will read and hear if you go to the Fowler Museum site, has many complicated meanings for him that refer to the trashing and recycling of materials - many of the materials having to do with food and drink - and to the effects of "globalization, consumerism, waste and the transience of people's lives in West Africa and beyond." 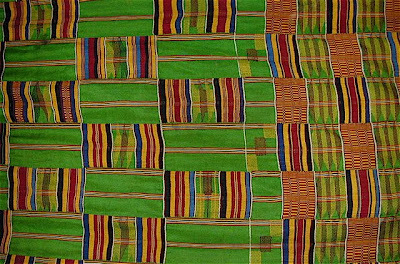 Perhaps the most well-known African woven cloth is kente, which is woven (by men) on narrow horiontal treadle looms by the Asante people of Ghana and the Ewe people of Ghana and Togo. Strips of the cloth are sewn together to make a wider fabric. 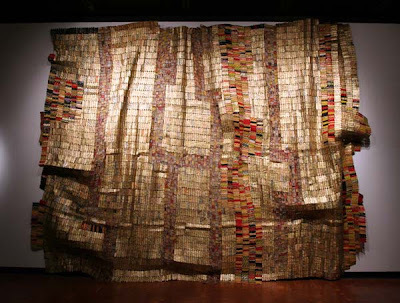 Anatsui's father and brothers wove kente in more muted colors used by the Ewe peoples, and this apparently influenced his creation of the metallic cloths that seem to be woven from the castoff aluminum wrappings he uses. 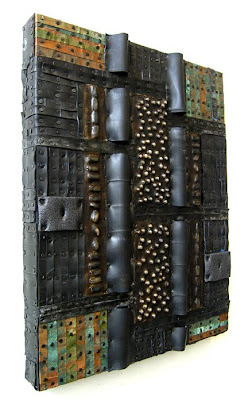 Anatsui is quoted as saying, "I have discovered only much later . . . that cloth has been a recurring theme or leitmotif, and it is featured in so many dimensions." You see that Anatsui and I have the realization of cloth's importance in common. I think the reason that it takes so long to come to this awareness is that cloth is so ubiquitous. Its importance doesn't quite dawn on us when its use is not addressed directly as in sewing, weaving, dyeing, etc. In my own case, I did quite a bit of resist dyeing at Mass. College of Art so I don't have this excuse, but it has taken me all this time to make the extension of thought and finally utter the DUH, or is it D'OH. These next three are the last of the new ones. They have some color in them - orange - which seems very full of life and related to the sun. These pieces still have a very dark feel but maybe not as dark as the books. What do you think? 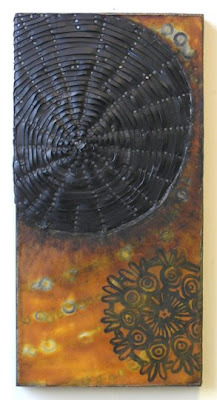 "Black Sun", 24" x 12", encaustic, rubber, tacks, oilstick, patinated washers. 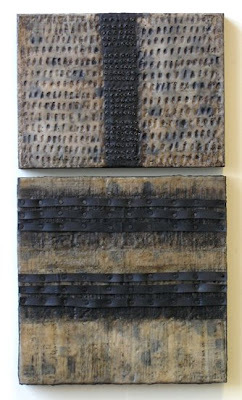 "Once Upon a Time", diptych, each panel 12" x 12", encaustic, rubber, tacks, beads, crochet. This one is my favorite. These are the first of yet another series, so you can see I have my work cut out for me. Here are three more of the new works I made - these using pages from old books that I dipped in encaustic and then obscured with more wax or other media. These are the first three in a series I am planning using books. 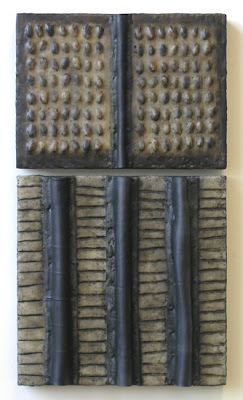 "Tale of Shadows" diptych, top panel 9" x 12", bottom 12" x 12", book pages, encaustic, oilstick, rubber tacks. "Text Without Words", diptych, top panel 9" x 12", bottom 12" x 12", same materials as above plus pistachio shells. 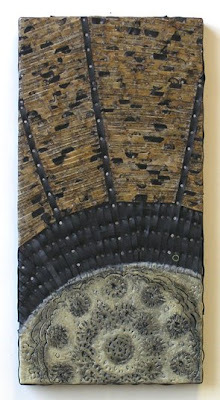 "Shadowed Past", 24" x 12", same materials as above without the shells.